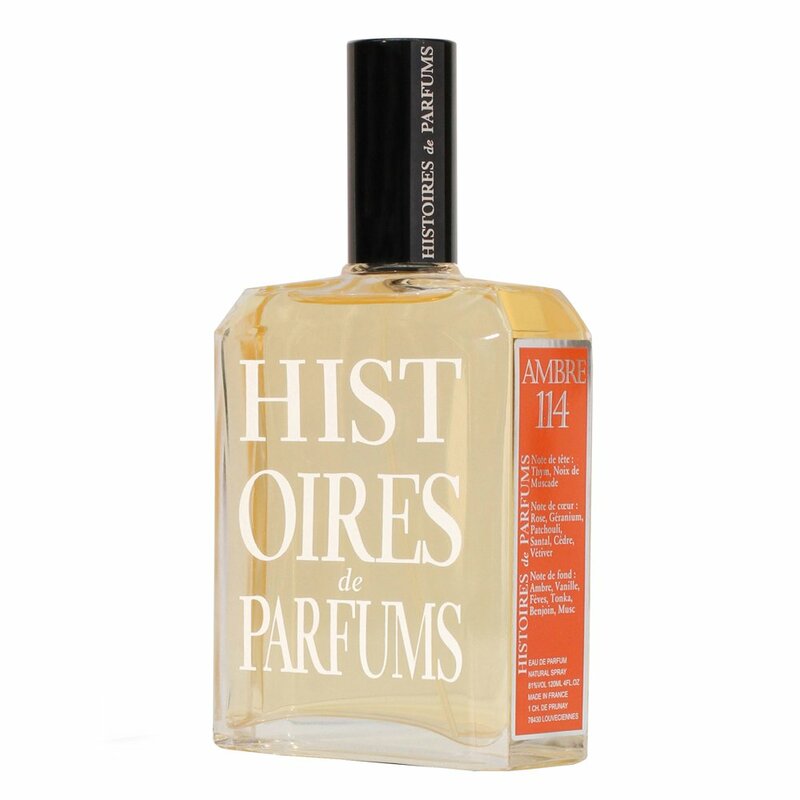 The scent of Ambre 114 by Histoires de Parfums elicits a delicious, tickly shiver that runs down my spine. I call it my new easy lover. This particular perfume was designed to charm with its supposed simplicity dressed in a golden, powdery amber. The spicy opening communicates with the wearer through a secret fragrant dialect, known only by the two of them. A trip to an illegal fortuneteller whose room lies above a spice market, with freshly delivered nutmeg and caraway boxes. The heart notes: sandalwood, patchouli, vetiver, cedar, rose and geranium are steaming hot, like Finnish sauna in the middle of a flower field. An understated flower field. Posh, outrageous amber gently assaulting your senses is your reward in the dry down. The perfume has smoky dry, comfortably sweet and extrovert quality, giving a sense of incandescent pleasure. If you were expecting a solo act from the amber, I am so sorry for the disappointment, but the amber is so beautifully balanced by patchouli and nutmeg, it is sinfully pleasurable experience. The body of the fragrant composition is comprised of spicy amber, an intense dose of nutmeg-hearted amber accord, imparted within smokeless patchouli. Putting on my boyfriend jeans and sky scraping heels, it is the fragrant bridge between manly attitude and seductive red lipstick. Katharine Hepburn in a bottle. The sensual, introvert floral facets of the perfume speak of slight romantic inclinations, trying to find its place between the hippie and luxury vibe that perfume simply oozes. And last but not the least, the nutmeg, vanilla and tonka bean interplay give Ambre 114 a very, very subtle gourmand-ish essence about it. Warning: A sexiness-inducing perfume. It is not the perfume which you should wear to work, unless you work with your ex and you want to prove how wonderful your life has turned since he/she is no longer in the picture. Base notes: Tonka bean, Amber, Benzoin, Vanilla and Musk. The most prominent notes are amber, vanilla and benzoin, while its projection and longevity are strong and the sillage is heavy.